Named a National Historic Landmark due to its connections to the history of American music, Shreveport Municipal Auditorium will begin offering public, guided tours in October 2018 and will continue to offer tours on an ongoing basis. 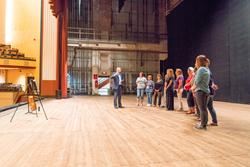 Guests tour Shreveport Municipal Auditorium, a National Historic Landmark located in downtown Shreveport, La. Shreveport Municipal Auditorium is a National Historic Landmark known internationally for its role in music history. Shreveport Municipal Auditorium is a National Historic Landmark known internationally for its role in music history. It also has another notable distinction: It is said to be one of the most haunted places in North Louisiana, and has been featured on SyFy’s Ghost Hunters and Discovery Channel’s Ghost Lab. Throughout the month of October, Shreveport Municipal Auditorium will offer ticketed, public tours of the historic venue, including a Backstage Music Tour on Oct. 21 focused on music history and Haunted Shreveport Municipal Auditorium Tours on Oct. 25, 27, 28 and 31 exploring reports of paranormal activity. Future public tour dates will be posted soon at http://www.ShreveportMunicipalAuditorium.com. Tickets to the tours are $20 each. Tickets must be purchased in advance and are on sale now at http://www.ShreveportMunicipalAuditorium.com. No walk-ups will be accepted. All tours are subject to cancellation and, if that occurs, payment will be reimbursed electronically. Proceeds raised from these tours will benefit the museum located inside of Shreveport Municipal Auditorium. The Backstage Music Tour will be held at 2 p.m., Sunday, Oct. 21. An expert tour guide will share stories and songs of the many stars that have graced the stage of Shreveport Municipal Auditorium since its completion in 1929. Haunted Shreveport Municipal Auditorium Tours will be offered at 6:30 p.m. on Oct. 25, 27 and 31. Haunted tours will also be offered at 8:30 p.m. on Saturday, Oct. 27 and at 2 p.m. on Sunday, Oct. 28. Tickets for all tours are on sale now. For more information on Shreveport Municipal Auditorium, visit http://www.ShreveportMunicipalAuditorium.com. For more information on planning a trip to Shreveport-Bossier, visit http://www.Shreveport-Bossier.org or call (800) 551-8682 to request a free copy of the 2018 Official Visitors’ Guide to Shreveport-Bossier.